There is a reason over 85% of all marketers worldwide are using content marketing to generate more sales. On average, consumers engage with 11.4 pieces of content before making a purchase. Moreover, up to 80% of all users only focus on organic results and ignore all paid ads. Digital advertising has only 11% of the average business marketing budget today, while content marketing has 13% and is expected to only increase in the coming years. Furthermore, email marketing is an ideal channel for promoting, distributing, and multi-purposing your content. Email and content marketing are natural complements – they go together as deliciously as Oreos and milk. Plus, what you may not know about content marketing is that it costs 62% less than outbound marketing! 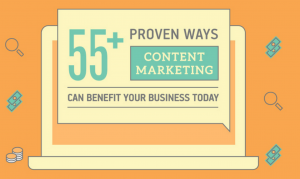 Check out the infographic below for more ways content marketing benefits your business and helps you attract new customers.